July 2008 was an extremely remarkable month! 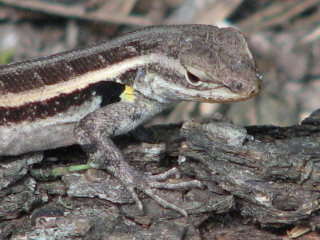 Lifers include GRAY CRACKER, ROSE-BELLIED LIZARDS, WRIGHT'S YELLOW-SHOW (which was also a first record for Hidalgo County), and FRITZGAERTNER'S FLAT! Also nice was a BADGER seen at Bentsen's Hawktower! A wonderful happening at Bentsen was a FISH SURVEY at Kingfisher Overlook by Robert and Deb Edwards. July 2 LaFeria Sod Farm The wet freeway encourage me to take the back roads to work, which means I got to drive by: Black-bellied Whistling-Duck 50, Fulvous Whistling-Duck 22, Mottled Duck 2, Cattle Egret 7, White Ibis 10, White-faced Ibis 50, Killdeer 2, Black-necked Stilt 250, Lesser Yellowlegs 250, Mourning Dove 10, Common Nighthawk 3, Great-tailed Grackle 120, Bronzed Cowbird 50. After work, the Sod Farm had Black-bellied Whistling-Duck 18, Mottled Duck 3, Northern Bobwhite 1, American Coot 1, Killdeer 3, Black-necked Stilt 70, Mourning Dove 6, Common Nighthawk 3, Horned Lark 3, Dickcissel 4, Red-winged Blackbird 17, Eastern Meadowlark 1, Great-tailed Grackle 98, Bronzed Cowbird 10. July 12 It is truly amazing to be paid to do something as fun as a butterfly count, all day at Bentsen, NABA, Mission West, Lucy's Garden... A GRAY CRACKER showed up at NABA! Wow! The official results by Dave Dauphin as recorded on the TexLeps listserve: "14 people participated in the Bentsen Rio Grande Valley State Park/NABA-IBP count, held on July 12, 2008. Temperature 76-96 degrees. Wind from SE 16-26 mph. 8:00 a.m. to 5:30 p.m.. Overcast from 8-10 in the morning, partly cloudy to clear the rest of the day. We had six to eight inches of rain in the count area the week prior to the count. We visited World Birding Center/Bentsen, Bentsen Lake garden and pavilion area, Bentsen Palm Village RV, Mission West RV, NABA International Butterfly Park, Lucy's Garden, and Chihuahua Woods Preserve. 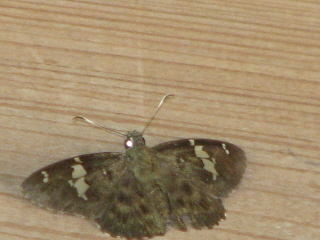 A total of 61 species were found. 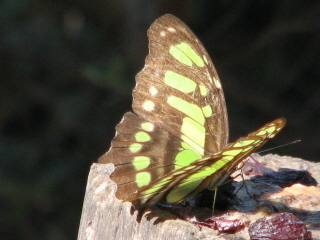 Highlights were: White-Angled Sulphur, Yellow-Angled Sulphur, Gray Cracker, Malachite, Ornythion Swallowtail, Florida White. July 13 Pretty much the same people turned out today for the Annual Santa Ana Butterfly Count. 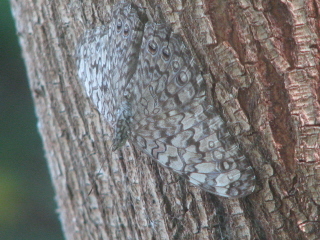 After a couple of group areas, Josh and I split to walk the entire Jaguarundi Trail which proved to be very a good move since we got the only Malachite, the only Mexican Bluewing, three VARIEGATED FRITILLARIES, and many ROSE-BELLIED LIZARDS which I have not seen in our park at Bentsen. Black Witches were plentiful even in the hot summer day hours! 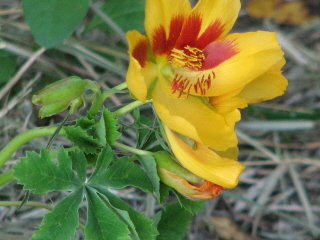 We also found this beautiful flower right out front, blooming in the shade under a bush. 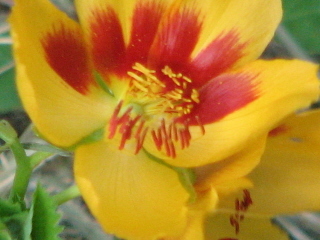 Turns out that it's a Wright's Yellow-Show (Amoreuxia wrightii). Josh found out from Christina Mild that it's RARE! In fact, it turns out that it is a first county record for Hidalgo County!! And Texas is the only place in the United States that it grows! 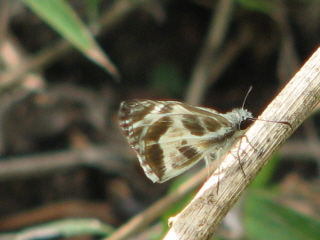 The official results from TexLeps: "Twelve people participated in the Santa Ana NWR/Weslaco NABA annual butterfly count on July 13, 2008 from 8:00 a.m. to 4:00 p.m.. Temperature 76-97 degrees. Wind 12-15 miles from from SE. Partly cloudy in morning to mostly clear in afternoon. 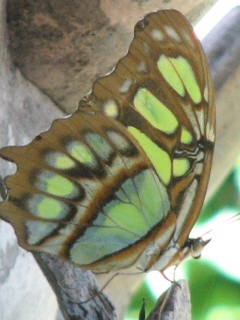 Highlights were Malachite, Silver Emperor, Mexican Bluewing, and Guava Skipper. We visited Santa Ana NWR, Estero Llano Grande SP-WBC, Frontera Audubon, Weslaco Duranta Hedge. July 14 Bentsen A lot of housekeeping at work today, including hummingbird feeders and making suet. Best part was when Josh found a FRITZGAERTNER'S FLAT just outside our door! Amazing! July 27 Bentsen The park was officially closed today but a man from California showed up for the bird tour anyway, so Jerry and I took him out: Black-bellied Whistling-Duck 3, Mottled Duck 2, Plain Chachalaca 12, Northern Bobwhite 3, Least Grebe 4, Pied-billed Grebe 5, Anhinga 1, Great Blue Heron 1, Great Egret 1, Green Heron 1,Yellow-crowned Night-Heron 1, Turkey Vulture 3, Gray Hawk 1, Crested Caracara 1, Common Moorhen 2, American Coot 15, White-winged Dove 50, Mourning Dove 6, Inca Dove 1, Common Ground-Dove 2, White-tipped Dove 3, Yellow-billed Cuckoo 12, Greater Roadrunner 3, Groove-billed Ani 8, Lesser Nighthawk 1, Buff-bellied Hummingbird 3,Golden-fronted Woodpecker 10, Ladder-backed Woodpecker 3, Northern Beardless-Tyrannulet 1, Brown-crested Flycatcher 1, Great Kiskadee 9, Couch's Kingbird 6, White-eyed Vireo 1, Green Jay 14, Purple Martin 1, Bank Swallow 2, Cave Swallow 27, Verdin 1, Clay-colored Robin 1, Northern Mockingbird 12, Long-billed Thrasher 2, Olive Sparrow 6, Northern Cardinal 7, Dickcissel 2, Red-winged Blackbird 50, Great-tailed Grackle 17, Bronzed Cowbird 19, Altamira Oriole 3, Altamira x Audubon's Oriole (hybrid) 1. Three baby Anis played in the water outside my office window today. Cute as the dickens, but keeping Mama Hooded Oriole out. She looked disturbed. Those big beaks must have had something to do with it. July 28 Bentsen Spent the morning at the Hawktower with Mike and Dave of CA. Only highlight was a Swainson's Hawk although Mike had seen 3 SwallowTailed Hawks earlier! Putting stuff back together from the hurricane was dull, as was answering e-mails, but the butterfly walk was fun: 18 Giant Swallowtail, 5 Great Southern White, 1 FLORIDA WHITE, 1 Giant White, 1 WHITE ANGLED-SULPHUR, 1 Southern Dogface, 17 Cloudless Sulphur, 8 Large Orange Sulphur, 62 Lyside Sulphur, 7 Little Yellow , 1 Lantana Scrub-Hairstreak , 3 Mallow Scrub-Hairstreak, 7 Western Pygmy-Blue, 18 Ceraunus Blue, 1 Reakirt’s Blue, 1315 American Snout , 14 Gulf Fritillary, 1 Mexican Fritillary, 2 Bordered Patch , 1 CRIMSON PATCH, 12 Phaon Crescent , 1 PALE-BANDED CRESCENT, 1 MALACHITE, 4 Tawny Emperor, 1 SILVER EMPEROR (male), 27 Queen , 1 Soldier , 8 Brown Longtail, 2 Brown-Banded Skipper, 3 White Checkered-Skipper, 9 Laviana White-Skipper, 1 Turk’s Cap White-Skipper. July 29 Bentsen The Malachite was still there today. At 2pm as we were headed out to lunch, Josh pointed two SWALLOW-TAILED KITES above us. July 30 Bentsen Today was the Butterfly Walk at Bentsen with the Rickards: 20 Giant Swallowtails, 3 Great Southern Whites, 1 Giant White, 1 Southern Dogface, 17 Cloudless Sulphur, 4 Large Orange Sulphur, 1 Orange-Barred Sulphur, 11 Lyside Sulphur, 12 Little Yellow , 2 Gray Hairstreaks, 1 Lantana Scrub-Hairstreak , 1 Mallow Scrub-Hairstreak, 3 Western Pygmy-Blue, 12 Ceraunus Blue, 1 Reakirt’s Blue, 4 Fatal Metalmarks, 5 Red-Bordered Metalmarks, 850 American Snout , 16 Gulf Fritillary, 2 Mexican Fritillary, 1 Bordered Patch , 10 Phaon Crescent , 1 White Peacock, 1 MALACHITE (smaller than yesterday's! 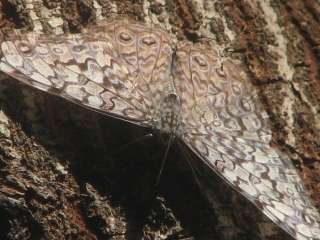 ), 1 GRAY CRACKER, 1 Hackberry Emperor, 1 Empress Leilia, 6 Tawny Emperor, 32 Queen , 1 Soldier , 1 White-Striped Longtail, 6 Brown Longtail, 5 Brown-Banded Skipper, 2 White Checkered-Skipper, 6 Laviana White-Skipper, 1 Turk’s Cap White-Skipper, 1 Clouded Skipper, 1 Fiery Skipper, 1 Sachem, 1 Whirlabout. July 31 Bentsen Dragonfly Walk today I had a young man and his grandfather so we moved kinda slow, still getting 14 easy expected species: Spot-Tailed Dasher, BandWinged Dragonlet, Wandering Glider, FiveStriped Leaftail, FourSpotted Pennant, Eastern and Great Pondhawks, Red Saddlebags, Black Setwing, Roseate Skimmer, BlueRinged Dancer, Rambur's Forktail, and Smoky Rubyspot. One can tell just by reading the list that we merely accepted the obvious but such is good with guests such as these. A threatened Texas Tortoise did cross the road near the bridge, right under our noses.